Along the southern border of this area is the C & O Canal which was dug in the 1830’s as a way for communities and businesses along the Potomac River to transport coal, lumber, grain and other agricultural products to market. The river generally flows 10 or 20 feet below the old canal ditch, which was dug from a terrace of sediments deposited on top of the redbed rock along the Potomac. While most of the sediments were deposited millennia ago when the river channel stood much higher, major floods in 1936, 1942 and 1996, as well as from the high waters by Hurricane Agnes in 1972 have contributed to the sediments. 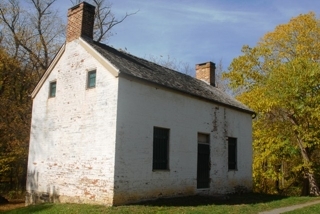 Additionally, thick deposits of upland gravel run in a band south from the mouth of the Monocacy River through the historic black community of Martinsburg to the intersection of Edwards Ferry and Offut Roads, and continue south to Sterling Park, Virginia, where they make a sharp loop north. Stained and rounded stones, some the size of melons, mark the course of the Potomac about a million years ago, before it swung west into its present horseshoe bend. Active tributaries like Horseshoe Branch and Chisel Branch are adding still further refinements to the picture as they carve their own shifting valleys and channels. 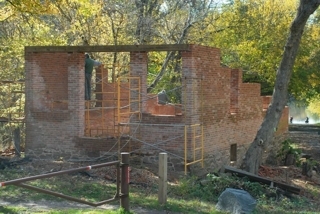 Before unloading your bike, cross the nearby bridge and study the abandoned C & O Canal ditch. When constructed, the sides and bed of the ditch were lined with clay to keep precious water from percolating out, and since much of the liner has stayed intact after the canal’s abandonment in 1924, silver maple, elm, spice bush and other wetland species have taken hold on the banks. The vegetation attracts legions of acrobatic insect-eating birds such as warblers, vireos, and fly-catchers. Across the towpath, look over to tree-lined Van Deventer Island (called Maddox Island by some) once part of the terrace you are standing on, before the river carved a channel around it. Most of the soils from here to River Road are deep, well drained and among the most productive in the County. They are referred to as “alluvial” to indicate they were transported by the river from upland valleys, not eroded in place from the weathering bedrock. Because of their fertility and attraction for wildlife, the level fields around the parking lot saw intermittent use and occupation by the Indians, and were intensively farmed during canal days. 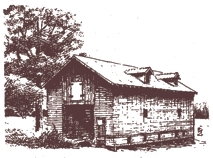 Until 1924, canal boatmen stopped by at a nearby grain warehouse (known as “barracks” to old farm hands), to load wheat for the Georgetown mills, and return with fertilizer and summer delicacies such as watermelon. 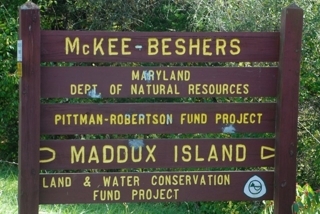 Even now, as part of the McKee-Beshers Wildlife Management Area, the land still yields food for the local wildlife, planted in strips of corn, shrubs and grasses. A second set of bridges crosses a tributary and then Horsepen Branch again, over swampy ground that features big sycamores on the streambanks. In the Agnes flood, backed-up water from the Potomac drove Horsepen Branch back on itself, pushing fish and driftwood upstream over the road and bridges. This is a nearly barren rock face, on the right about three hundred yards before the intersection of Mt. Nebo Road. Material washed from here and higher on the hill has created still another wetland on the flats below, marked by willows and a big white sycamore – small comfort to parched occupants of the shale bank. River Road was at one time an Indian path, and later a tobacco rolling road (so named for the rolling of large wooden barrels packed with tobacco along its path). In 1808, the Maryland General Assembly designated the section from Edwards Ferry to Tenleytown in modern Washington DC as a public road, and it has been in continuous use ever since, broken today by the two-mile gap between this point and Edwards Ferry. Mt Nebo Road, named for an old farmstead that was just uphill on the left, is the detour. Land and farm buildings at the intersection are part of the Summit Hall Turf Farm. Go right and up the grade on Mt. Nebo Road. As you travel along the road examine the right side of the road cut for rounded cobblestones mixed with chips of shale bedrock. Potomac “bottomlands” were once a succession of river beds and terraces on the present upland, abandoned by the river as it shifted its channel to the west. A million years ago, these rocks bounced along the river bottom, being rounded and polished by river sand. Today these stones are found in a dry woodland, on the rim of a deep ravine cut by a tributary of Horsepen Branch. The underlying uplands made of red sandstone and shale, are full of joints and fractures that drain away subsurface water. Trees such as oaks and hickories have long taproots so they are able to thrive. At the top of the grade, pause for a spectacular view of the Catoctin and South Mountains to the west. After Indian days, almost all of western Montgomery County was timbered to make way for farms. Where before stood giant old-growth trees such as sycamore along streams, and white oak and hickory on uplands, today you’ll find plants that move in whenever people no longer cultivate the land. Blackberries, multi-flora rose, and goldenrod are among the first to pioneer in old redbed fields, followed by locust, persimmon, sassafras, and other saplings that can tolerate a dry environment and intense, direct sunlight. If undisturbed by fire or clearing, oak, hickory and dogwood will eventually succeed them. Soil erosion and fertility depletion has turned the once rich farmland into marginal agricultural land. The upland area is too far from the modern river to be renewed by alluvium from periodic flooding so the area is now used primarily for pasture and to produce hay. 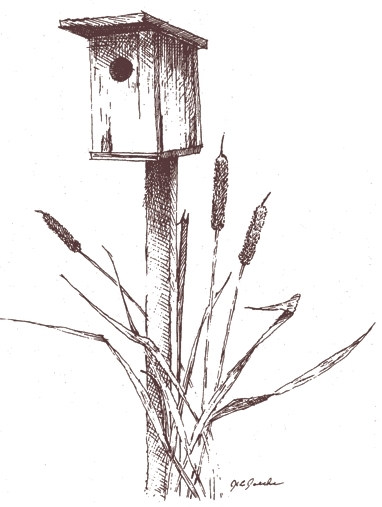 Roadside vegetation found along the way is partly the work of songbirds, who perch on fenceposts and telephone wires and sow seeds in their droppings. The field on the right and the woodlots and road cuts on Edwards Ferry Road are full of large and small cobblestones, rounded and water-stained from having been on the bottom of a river. This is the largest deposit of old riverine material on the trail: Edwards Ferry Road exposes a cross section over a mile wide, including several boulders the size of beach balls. 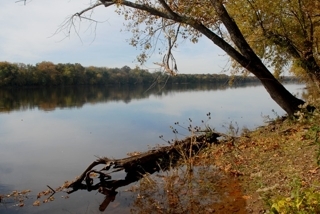 The topography may once have looked like Sycamore Landing – as the Potomac deepened its channel, materials that lined the sides of the old riverbed were left behind on the shore to become part of a wide terrace. Even today, after millennia of weathering, parts of this upland are remarkably flat. The former course of the Potomac that flowed a million years ago or more, and where its shifting channels and tributaries lay, have been traced from the deposits in this area and from similar evidence at Martinsburg, Mt. Nebo Road, and in Virginia. The old river, flowing down from the vicinity of Martinsburg through this area and south into Virginia, would have met the present horseshoe channel at right angles west of Sycamore Landing. Cobbles and pebbles washed and tumbled to this point from distant hills are now two miles from the present river at Edwards Ferry and about 120 feet higher. The Potomac River is about one-fourth of a mile wide here. Imagine the river transposed to the upland at Offut Road a million years ago, with a bank like the one you are standing on, and a wide terrace behind that. Early man had not appeared, but mammoth, mastodon and perhaps the saber-toothed tiger had worn paths to favored drinking holes across a scene dominated by mixed hardwood and evergreen trees. Since a glacier had advanced into parts of Pennsylvania and Ohio, the climate was colder than now and in winter and the waters of the Potomac were likely to be solid ice. 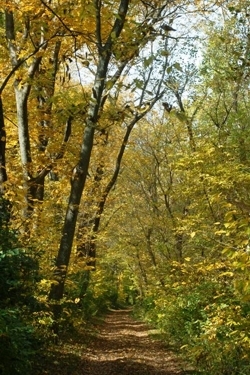 From Edwards Ferry, the trail follows the canal towpath back to Sycamore Landing, a distance of about a three miles. About 700 acres of alluvial fields are farmed in three-year cycles of grasses. This and other turf farms on similar terraces above Edwards Ferry supply turf to resod everything from lands cleared for metropolitan area subdivisions to football fields, golf courses, highway medians and recreational areas. About one inch of soil is removed with the sod when it is harvested. In this way the river’s rich soil bounty is being redistributed to various areas from which, in time, it will draw “new” sediment for channels and terraces yet to be carved. 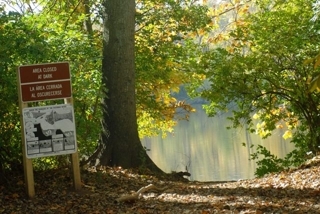 To see the old hand drawn Trail Guide site maps for the Potomac Bottomlands Trail (now out of date), please go here.